would i drown in my shallow regret?" She is a very talented guitar and keyboard player, a wonderful singer and a dynamite songwriter. Her songs are ethereal, emotional, and striking, yet she addresses the little nuances of life with the same force as she deals with the larger issues. Sarah was born in Halifax, Nova Scotia, on January 28, 1968 and studied classical guitar, piano and voice as a child. She was discovered by Nettwerk Records at the age of seventeen but parental reluctance kept her from signing with them for two years. Sarah relocated to Vancouver and began writing the songs for Touch , released in 1988. Much to her surprise the record went Gold and she was suddenly hailed as that year's most promising artist. After an extensive tour (she tends to do that a lot still) Sarah returned to the studio to record Solace , an emotionally raw album quite different in style from Touch. Released in 1991, Solace affirmed Sarah's position as a faerie (oops), and, as everyone puts it, "rocketed her to international prominence". After an exhausting 16 month tour, Sarah returned to Vancouver to write the songs for her third album, Fumbling Towards Ecstasy . FTE is a more personal album, resulting from a kind of six-month "retreat" with longtime friend and producer Pierre Marchand. Sarah describes the writing of Fumbling... as, "a kind of therapy", a process which enabled her to overcome many long standing fears and concerns by articulating them in her music. (thanks again, Nettwerk) Fumbling... represents metaphorically the stripping away of the things that prevent us from attaining happiness. The songs vary in content and style from something like "Possession", a dark tale written from the perspective of an obsessed fan (my guess is Uwe Vandrei) to a more lighthearted tune like "Ice Cream". Plus everything in between. 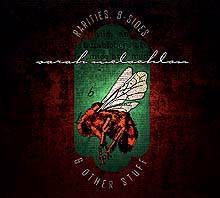 Partway through the tour, Sarah took time to launch the release of The Freedom Sessions , an EP of so-called studio versions of some selections off Fumbling... . The Freedom Sessions is also available with an extra CD-ROM track that has nice pictures, video clips, and all sorts of Sarah information. Very nice. 1997 was a busy year for Sarah. In addition to releasing Surfacing , Sarah organized and headlined Lilith Fair, a music festival with all-female performers. Its third year wraps up in 1999, after which Sarah plans to take a lengthy hiatus from performing and recording, while she spends some quality time with her husband Ashwin Sood. Before she does retreat from the spotlight, however, she will be releasing a new live album with performances culled from the Surfacing tour. This disc is entitled Mirrorball and will be available in stores on June 15th, 1999.